I’ve recently returned from spending nearly 3 weeks exploring Ethiopia. It was a fascinating trip, although it was also much more challenging than I expected. Between high temperatures, strenuous hikes, and persistent food poisoning, the trip really beat me down in a lot of ways. What follows is a trip report for the second half of the trip. You can read about the first half of the trip HERE. I departed the hotel at 10am for the 40 minute drive to the airport. We stopped at 2 other hotels to pick up more people, and then bounced along the dusty road. at the airport i had to be subjected to the same security theater as in axum. A disgruntled guard demanding to see my passport just to enter the airport grounds. Then another to enter the terminal. Then The normal security screening to enter the terminal. But they wouldn’t actually let me check in for my flight yet because some other flight was departing first, and they had just 1 ticket agent who was overwhelmed dealing with the next flight line. After waiting for an hour, they finally, let everyone on my flight check-in, and proceed to the terminal’s only gate. Amusingly, since the terminal has no AC, they opened the door to the tarmac to let some air in, and left it to the honor system for people to not wander outside. the flight was uneventful, and i found my driver​ easily as i exited the airport. It was about a 30 minute drive into the city and the hotel. The hotel looks like it was built before ww2. Huge elaborate lobby, stone on the exterior, and my room feels like a closet. After dropping off my bags, we drove a few blocks to get lunch at a really nice restaurant called ‘the 4 sisters’. It had this elaborate garden, and a patio, and a nice menu with traditional ethiopian food, and also some western stuff. I had shiro which was yummy. They gave me a complimentary shot of honey wine at the end, which was a nice bonus. Following lunch, we started the city tour. The first stop was a church (yes, another) from the 17th century. It was significantly newer than the majority of the churches that i saw previously, and was a completely different setting and architecture. Gondor on the whole feels like a much more verdant city, with lots of trees, flowers and plants growing everywhere. This church had a lot of painted art on all the walls and ceiling. One thing that i will say is that my guide here was a significant improvement over the loser in lalibela. today’s guide was really motivated, and had photos and movies and even a book to better illustrate stuff he was talking about. After the church, we went to emperor fasilide’s bath. 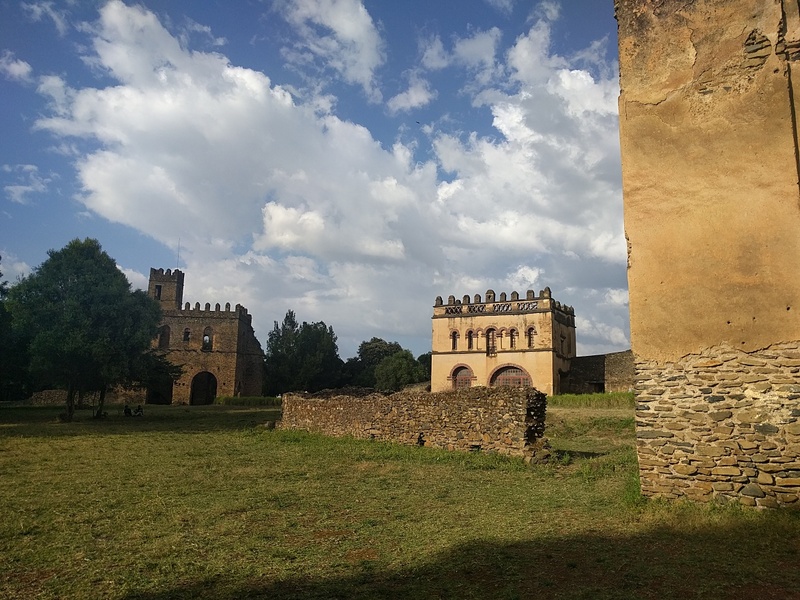 This was the summer home and swimming pool of the 17th century king of ethiopia. The scenery was pretty, although it looks like a moat now, rather than a pool. the Last stop was easily the most impressive. It was the emperor fasilides palace grounds. but it wasn’t just one castle, but 4, as each king after him built another Castle. These were european style castles, with turrets, and towers, and they looked amazing. Only the first one is in good enough condition to go inside. The others were badly damaged when the british were trying to bomb the italians out of the country during ww2. We spent nearly 2 hours wandering the grounds, exporting the different buildings. It was really amazing. I departed the hotel at 9am, to drive 100km to the town of Debark where tbe Simian Mountains NP headquarters are located. We were climbing elevation the entire drive (from around 6k to 9k). After purchasing the park permit, supplies (food, camping gear, etc), and picking up the guide, cook & guard/scout, we continued into the park. After driving another 25km, we pulled over to the side of the dirt road, and the guide, scout & I got out. This was going to be the starting point of today’s hike. The driver & cook continued driving to the camp site for tonight. At this point we were just above 10k feet, and the views off to the left were amazing. We were at the edge of a cliff overlooking a huge red canyon. The steep green mountains had tendrils reaching into the canyon. It looked very similar to the mountains and canyon in Kauai. the terrain where i was hiking looked nothing like the other parts of ethiopia. Instead there were trees with moss and lichen, and the ground was dark soil, with tall green grass. Also it was cool with a nice breeze. We hiked for a while along the edge of the cliff, taking in the view. we stopped for a bit to eat a small lunch (bread, orange & banana). I dumped the orange & banana peels on the grass, thinking they would just degrade. But the guide freaked out, lecturing me that this was a national park, and i can’t ‘litter’. He picked up the peels, threw them in a plastic bag, and we resumed hiking. A few minutes later when we were especially close to the edge of the cliff, he tossed the entire bag over the edge. Apparently, as long as no one can see what you’re littering, then it doesn’t matter. About an hour into the hike we stopped at another viewpoint, where we caught up with a group of 6 from the isle of man. They were mostly older, but apparently long distance multi-day treks are what they do. There was also a couple there from london, whose guide abandoned them there an hour earlier. They ended up joining with my guide for most of the rest of today’s hike. The guy runs a bicycle shop, and his wife is a renal surgeon. Apparently they also do a lot of treks and long distance cycling all over the world. Overall, the hike was not difficult. While there was some elevation change (both up & down), it was never for too long, and much of the time the trail was mostly level. Also it was nice to hike on soft grass and soil for a change. We reached the campground a bit after 3pm. There were already 18 decent sized & quality tents setup. They brought me soap and water to wash my hands, and then i had some really bitter tea and sugary popcorn. Dinner was vegetable soup, and spaghetti with vegetables, and fried bananas for dessert. By the time i finished dinner it was completely dark, and the temperature had noticeably dropped. I brushed my teeth and retired to my tent. Just after i went to the tent last night, i started getting awful stomach cramps, and then had terrible diahrea. The entire night was awful. I couldn’t get comfortable on the sleeping bad, i was achy all over, my head felt very warm, while the rest of me was cold. I forced myself to get up at 6am, but i felt terrible. I tried to eat breakfast, but i had no appetite. I chatted briefly with a british guy, and he offered me some immodium. When my guide came around to see how i was doing, i explained how i was feeling. He gave me a few options. A really large waterfall was about a 90 minute hike away. I decided that i’d attempt to get there, and then decide what to do next. As i was hiking to the waterfall, it was obvious that i was never going to be able to do the remaining 4.5 hours of hiking to the night’s campsite. Every step was an ordeal, although somehow i managed to walk faster than an old Italian guy. The waterfall was quite impressive, coming off the side of the cliff, and plunging hundreds of feet to the valley below. 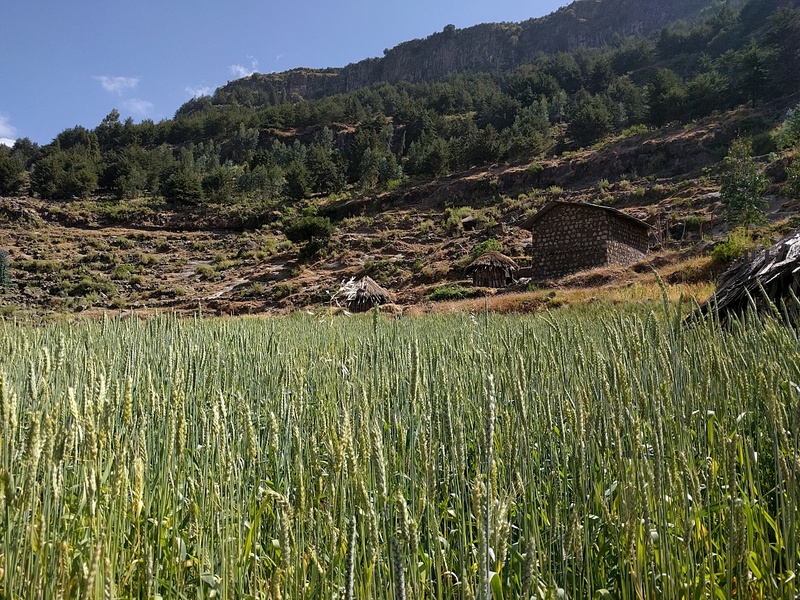 I told my guide that i wasn’t going to be able to hike further, and wanted a ride the 60km to the nearest town (Debark) where i could seek medical attention. this is when my day really started to get kinda crazy. The ride that he found me was some random other tourist’s van, which took me to a different campground. After waiting there for a few minutes a government pickup truck arrived. The bed of the truck had about a dozen park employees. However, my guide and i squeezed into the cab, sharing the passenger seat, with our bags stacked on our laps. It was ridiculously cramped, and i was nearly sitting on the stick shift. We then bounced down the park road for nearly an hour. Once we got to debark, we were dropped off, and the group of guides and drivers decided that it would be better if i continued back to Gondar for medical treatment, as the govt clinic in Debark is not that good. This meant that i needed to wait for my black bag to be sent to me, as it was originally supposed to be transported by mule to the next campsite. I ended up waiting an hour in a cafe, and gradually felt more & more lethargic and nauseous. Finally the van to drive me to gondar was ready, and we headed out. The entire 2 hour ride, i was alternating between falling asleep, and feeling increasingly nauseous. Finally, i couldn’t control it any more, and i screamed for the driver to stop. I leapt out, and vomited watery mucus all over a stone wall beside the road. After that my stomach felt much better, but i continued to drift to sleep for the remainder of the ride. I got checked into the hotel, and waited for someone else to take me to see a doctor. We ended up driving to the govt clinic, which in many ways reminded me of kaiser. Yes, it was 3rd world sketchy and run down. But they had all the expected departments, separated into rooms. I had to pay 30birr (about $1) to see the doctor. Then i waited a while before it was my turn, all the while being stared at by most of the other patients. The doctor was friendly enough, and spoke decent english. I explained what was going on since i entered the country. He suspected some kind of intestinal parasite or bacterial infection. But he refused to write me a prescription until i provided a stool sample for analysis. This is when things got really weird. The doctor wrote a lab order to analyse the stool sample. I paid 20birr (less than $1) for the lab work. The lab handed me a note card with a number written on it, what looked like a plastic juice bottle lid, and a tiny scrap of wood. They sent me to the bathroom, which was just as stinky, filthy and disgusting as you can possibly imagine. I managed to collect the sample, and literally walked holding it all back to the lab for everyone else to see. The lab told me it would take 10 minutes to analyse. The lab actually looked way more professional than i expected. But 10 minutes seems way too fast to perform a full analysis. Sure enough when the results came back, they claimed that i had no parasites. At this point the doctor attempted to send me away, but i wasn’t having any of it. I questioned which specific parasites and bacteria the analysis covers, and sure enough the doctor had no clue. I asked him if its possible that whatever i have just isn’t included in the analysis, and he conceded. At this point it was very obvious that he’s not at all used to having patients question his knowledge or authority, and he seemed genuinely flustered on what to do next. I suggested that he prescribe me a broad spectrum antibiotic, and he caved in. As we were leaving he commented that i had a lot of medical knowledge. we walked across the street to the pharmacy, to fill the prescription for amoxacylin. The pharmacy apparently puts all their prescription medication in a glass counter case. I suspect that i got ripped off, as they charged me 200birr ($9). The medication is made by a pharmaceutical company in Turkey. All the writing on the box is in english. The pills are in normal blister packs. I’m supposed to take it 3x day for 5 days. 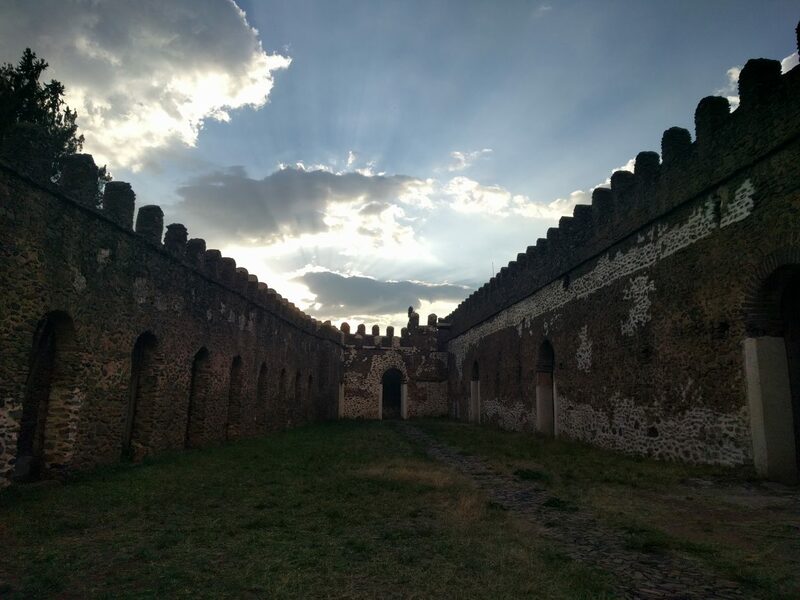 I’m staying in gondar for the next 3 days, after which i resume the itinerary. I left the hotel in Gonder at 8:30am, for the 3 hour drive down to Bahir Dar, the big city along the southern shore of Lake Tana. The drive down was uneventful. Although the driver was telling me that this region has experienced a lot of civil unrest in recent years. Farmers are frustrated that the govt isn’t investing in the infrastructure of the region. Their solution is to start shooting at cars along the highway. The govt responded by setting up military checkpoints, and generally deploying the army all over the place. Sure enough, i notice random soldiers camped out along the road every kilometer or so. As we head further south we descended​ in elevation, and i start to much more water everywhere. Farms are growing rice, and there are even water lilies growing in places. We arrived in Bahir Dar at mid day, and the city has a noticeable tropical feel, with lots of palm trees everywhere. I get lunch at a random hotel along the lake front. There are hundreds of huge pelicans everywhere. after lunch we drive out to the blue nile falls, which is the 2nd largest in Africa. What i didn’t know until we started is that its about 50km on a very rough road. The first 8km are supposedly going to be paved by the Chinese soon, but the rest is just lots of rocks and dirt the entire way. we pass a few small villages, and lots of farms growing sugar cane. Tons of kids are running around bare foot, and i see lots of women hauling those huge yellow jerry cans on their backs with water. Speaking of the water, there’s almost always an irrigation canal running along the road. Seems like its not just used for irrigating fields, as people are using it as their sink, bathtubs​, and washer, plus livestock are using if as well. the road dead ends, and then i hike with a guide for about 20 minutes to the falls. Not far upstream is a hydro-electric dam, which has been increasingly limiting the flow of the falls. The hike to the falls is mostly through farm land, and i pass lots of people working. The falls themselves are large, and loud, but i can also see how much bigger they used to be before the dam. i wasn’t looking forward to the drive back into the city. Especially since i drank a lot of water for the hike. So now my stomach had a ton of liquid sloshing around. Thankfully, i make it without any issues, but it wasn’t fun. Since we got into town a bit after 4pm, and my flight wasn’t until 8pm, we stopped at a drink place for a while to kill some time. They had a Walia Radler, which i decided to try. Its no Steigl, but was actually not bad. Plus it cost like 50 cents. I got to the airport at 6pm. Its a fairly modern airport (unlike the others that i’ve flown through). After getting my boarding pass, this guy demands that i follow him to the ‘immigration counter’. Keep in mind, i’m at a domestic airport, flying on a domestic flight. He demands my passport, and starts furiously flipping through the pages. At first he couldn’t even find the stamp for Ethiopia, and i could tell by the look on his face that he was about to yell at me. But then he found the stamp, but complained that it was missing the visa number. I stared at him blankly wondering what he expected me to do or say. he must have realized that he wasn’t asking me an actual question, and demanded to know my visa number. I told him that i had no idea, and asked if the immigration officer was supposed to write or stamp it in my passport. He gave me this look as if no one has ever pointed that out before, and picked up his phone to call someone. He yelled at someone on the phone for a full minute, then handed my passport back, and wished me a pleasant flight. Sooo..all i can guess is that the immigration officer screwed up and was supposed to include the visa number, but failed to do so. I guess i can look forward to more fun when i’m leaving the country. While waiting to enter the gate area, the entire airport lost power for about 2 minutes. Then when we finally entered the boarding area, they gad this super old CRT tv playing some russian ice hockey game. Its so bizarre. The flight was nearly empty. Like 10 passengers total. I met with the owner of the tour company after breakfast, and he asked for feedback thus far. i told him about the crappy guide in Lalibela. He said that all the official authorized guides in Lalibela are assigned on rotation, and it sounds like i was unlucky and got someone new/bad. He said he would contact the tourist bureau there to inquire though. Then he gave me a few options for today, since i had about 4 hours before i needed to be at the airport. I ended up going to 2 museums. The first was the ‘Red Terror’ museum which documented the country’s communist dictatorship years. It was interesting, although kinda small, with just 3 rooms. After that we went to the Museum of Culture, which was in the emperor’s former palace on the campus of the University of Addis Ababa. It took nearly an hour to get there, as traffic was horrible. I liked this museum a lot. They had tons of exhibits about all the different tribal groups, and their customs, plus the history of their currency, food, and clothing. Next we got lunch, which was the same place that i went on my first day. I didn’t realize it at the time, but it was already getting late. We drove to the airport, and by the time he dropped me off, it was already 10 minutes past the official boarding time for my flight. I still had to clear the terminal entry security, get my boarding pass, clear gate security, and get to my gate. The idiot checking id’s questioned my visa, i told her that it was ‘ok’, and she just took my word, and sent me through. I got to my gate just as they started boarding, and it was a bus gate. The flight was packed, even with the smaller plane, and it was 75% French retirees. Two of them were throwing a tantrum because they were not assigned seats together. The flight crew eventually moved them to the last row just to get them out of the way, as they were blocking the aisle. As we approached Arba Minch, i could see this huge, muddy brown lake below, surrounded by jungle. Its much wetter and warmer here. Everything is lush and verdant. The drive out to the ‘Paradise Lodge’ only took about 20 minutes. The lodge itself was built in 2008, and claims to be a 5 star ecolodge. Perhaps when it was new, but now its maybe 3 star. The lodge sits at the edge of a cliff, overlooking a valley which runs out to Lake Chamo. My room is a solid 10 minute walk from the main building (where food & wifi are provided). My room is basically slightly fancy motel6 (i even get a mosquito net). We departed Arba Minch just after 8am. After driving south for 40 minutes we turned off the road towards Lake Chamo. from there boarded a small boat with a canvas awning, and we headed out. It wasn’t long before we spotted hippos swimming. They were mostly submerged, but occasionally they would lift their heads out of the water. There were a few marsh islands full of thick reeds, where crocodiles and large birds (hawks, egrets, etc) were hanging out. The guide mentioned that the crocodiles on this side of the lake inside the national park were much less aggressive and hostile towards humans, because they didn’t to compete with fishermen for the food supply. On the other side of the lake, some crocodiles occasionally attacked fishermen. After returning to land, the guide insisted that we stop for coffee. The cup was easily 1/3 sugar, which seemed to be how they preferred it. After that we continued driving south towards Konso. For a while all we passed were huge corn and banana farms, with random small roadside villages. Then the pavement ended and we started climbing into the mountains. we passed lots of people hauling huge loads of stuff along the road. Once we started to descend on the other side the pass, everything became much less green, with cacti and dry river beds becoming much more common. Soon all the farms stopped too, and it was back to herds of cattle beside the road. Just after noon we got into Konso, which was much less a city than a mid-sized town. We stopped at the lodge for tonight to drop off my bags and get lunch. Initially there was a lot of confusion about my room reservation. All the discussion was in Amharic, but it seemed like the reservation was lost. Eventually they suggested that i eat lunch and my room would be ready afterwards. I had shiro for lunch, which was ok, but the beef was overcooked. After i finished eating, i inquired about my room, and it was finally ready. I inquired about wifi, and the owner/mgr (well dressed older man in charge) sighed. He said they do have wifi, but only in the restaurant area, but there’s no power currently. He said he has no clue if/when power will be restored, but they have a generator that turns on at 6:30pm. With that, i went to find my room. All the rooms appear to traditional style round mud huts with thatched roofs. however inside they are surprisingly nice, with modern materials. Its way nicer than the dumpy lodge that i was in the previous night. Next we headed back out to tour the area. We drove about 6km on pavement, then another 13km on a very steep, twisty, bumpy, rocky mountain road. Along the way we passed a lot of small Konso tribal villages and farms. there are a surprising number of trees, including junipers. Eventually we reached a clearing where the valley below opened up. We hiked a short distance, and this huge eroded rock formation came into view. It was reddish brown, and looked like hoodoos and pillars, very similar to southern utah. However, there were cacti and even wild flowers growing on it. It was amazing, and no one else was out there, beyond random local villagers going about their lives. After that we drove all the way back to the paved road, then turned off onto a short bumpy dirt road. This was the beginning of the UNESCO konso village site. its a stone wall enclosed ancient village which has existed for over 2000 years. as soon as one walled section would fill up, they would create another ring wall outside, and start occupying that section. Thus, as you walked inward through each walled ring, you went further back in time to the original village. The guide that i had still lived in the village, and he was amazing. Very slowly we toured the entire village. Each family has a compound, exposed in a wooden fence, which has different traditional round mud thatched buildings for different purposes (sleeping, animals, cooking, etc). Groups of compounds are neighborhoods, which share a communal ‘square’ open area which is used for events (funerals, weddings, trials, dances, etc). There’s also a jumbo sized community hut, which is used during the day as an informal gathering place (i saw people playing games, chatting, etc), but at night for housing guests and also all unmarried males age 12 & older. The boys act as the village guards. They historically guard against attackers, but also the fire patrol, and ambulance service. Prior to coming down to Konso, i had heard & read some stories that the villages are very touristy, with the residents getting dressed up & staging fake events, plus demanding donations. I was worried that it was going to turn out to be a very inauthentic experience. However, it was definitely nothing like that. While i did run into the residents of the village all over the place (everything from toddlers, to kids, to teenagers, to adults and elders), they were all just going about their lives. Some were friendly, others just ignored me. But no one was behaving as if they were performing for the tour. The entire tour was so amazing. It was like going to the equivalent of Colonial Williamsburg, without anyone being actors. I really now regret that i didn’t have way more time down here. From what i was told today, there are literally dozens of vastly different tribal villages in this region, and each is like visiting a new culture & country. Perhaps some are the tourist trap experience that i was warned about, but i’d be willing to take that chance if it meant having more experiences like today. Had i known better, i should have deprioritized all the non-stop churches in the north, and spent most of the trip down south. Btw, at this point i’m about 2 hours north of the Kenyan border, and a days drive east of the South Sudan border. Hundreds of other photos from the trip are posted HERE. You can read about the first half of the trip HERE.